Years ago I was told to avoid both caffeine and chocolate. Not exactly an easy thing to do, especially come winter when I'm shivering and craving a warm hot chocolate. 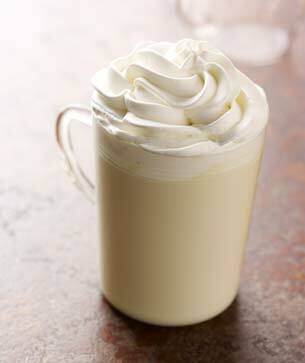 So I felt rather excited to find this white hot chocolate recipe. Now if you are like me and need to avoid those stimulating chemicals such as caffeine or chocolate then make sure the white chocolate you purchase is not made with cocoa. Stir together milk, vanilla and chopped white chocolate in a medium saucepan. Cook over medium-low heat, stirring occasionally, until the white hot chocolate comes to a simmer. (Do not let it come to a boil.) Remove from heat and serve immediately, topped with whipped cream or marshmallows if desired.